Create a lovely wall vase using gorgeous glass and beads. Prerequisite: Beginning fusing class. Expand on your basic fusing knowledge with this fun project Jennifer designed using iridescent glass, copper wires and beads. 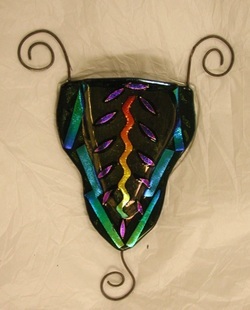 You will learn to work with Bullseye 90 thin glass, fiber blanket and incorporate wires.